I’ve made no secret of my love of Jewish Publication Society’s works. The JPS Torah Commentaries have greatly enhanced my reading of the first five books of the Bible. I have particularly appreciated the seamless blend of critical scholarship and devotional posture that series offers. In 2013 JPS published a massive, three-volume set, Outside the Bible: Ancient Jewish Writings Related to Scripture. The print edition has 3,302 pages. 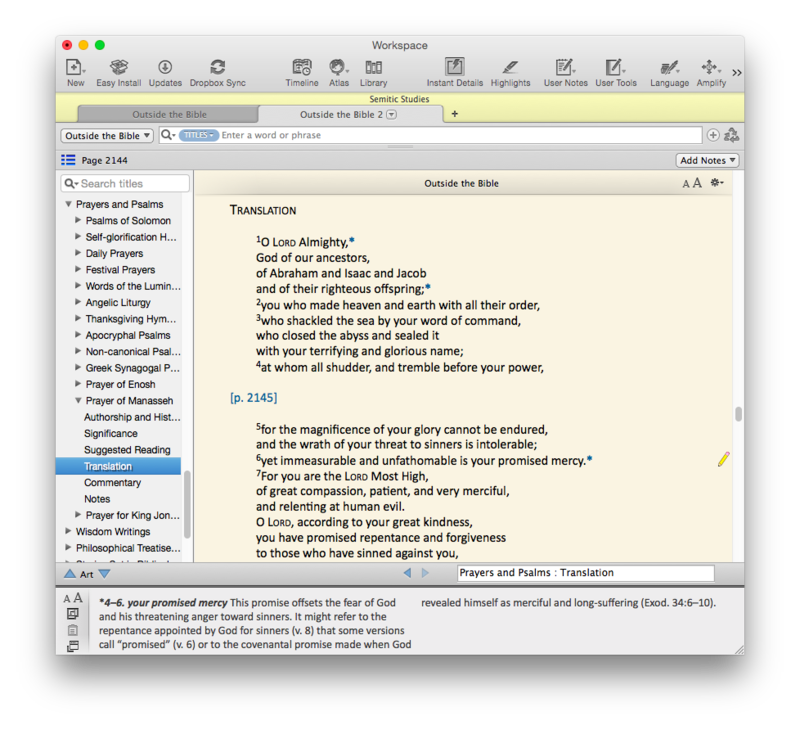 Accordance is the only Bible software program to have made the electronic edition available; it releases today. 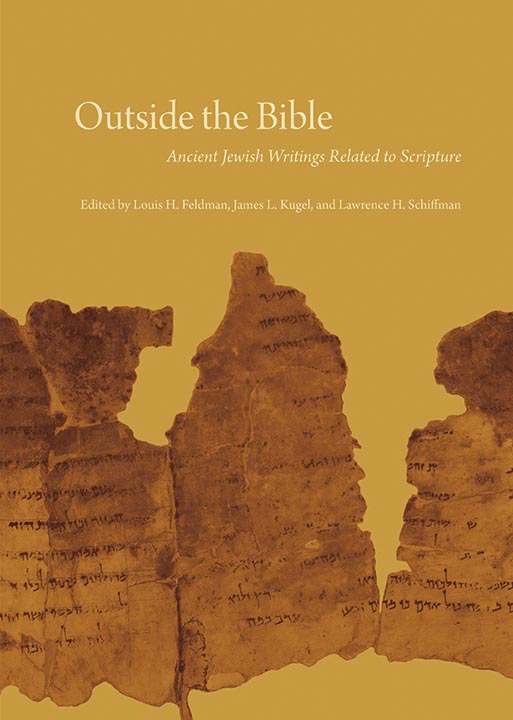 The editors of Outside the Bible are Louis H. Feldman, James L. Kugel, and Lawrence H. Schiffman. The skilled lineup of contributors includes: Harold W. Attridge, David E. Aune, John J. Collins, David A. deSilva, Michael V. Fox, Emanuel Tov, Benjamin G. Wright III, and many others. When trying to analyze the Hebrew and Aramaic words, the translators could not resort to tools such as dictionaries or other sources of lexical information; they had to rely on their living knowledge of these languages and on exegetic traditions relating to words and contexts. … By the same token, the identification of difficult words was often guided by the context. Such a procedure frequently was little more than guesswork, especially in the case of rare and unique Hebrew words. *there is none holy besides you Cf. 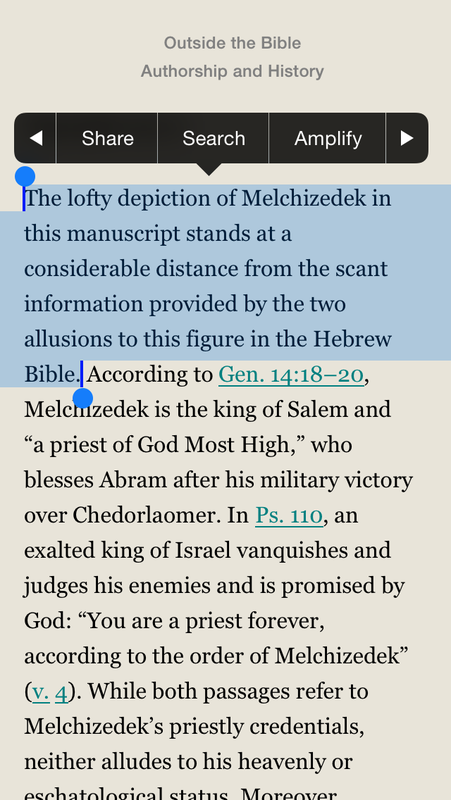 the MT: “There is no rock like our God.” As elsewhere in the LXX, the translator avoids the description of God as a “rock,” possibly because he did not like the comparison of God to a stone, and instead stresses his holiness as in the first part of the verse. 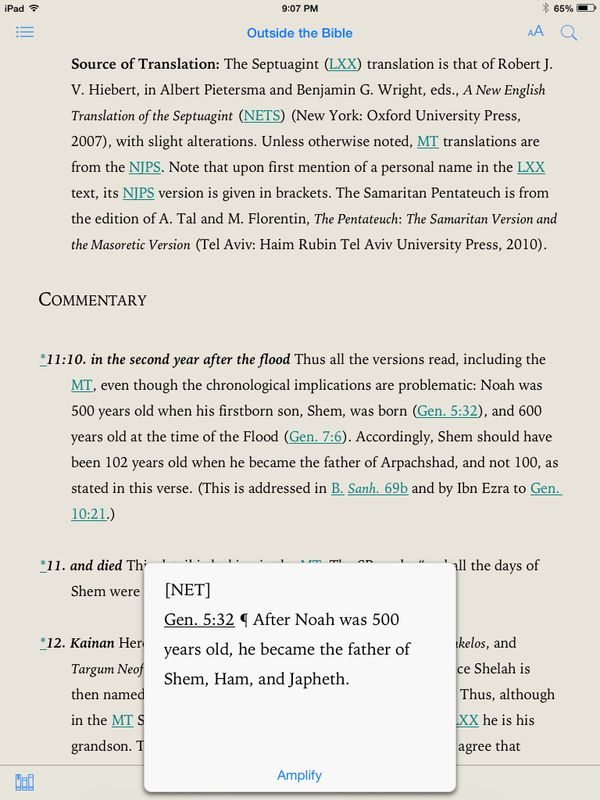 Each text in Outside the Bible is preceded by a brief introduction that gives a summary of its contents, a history of its composition and transmission, its significance for Jewish (and sometimes Christian) history and biblical interpretation, and a guide to reading that highlights specific issues for understanding the text. A short list of additional readings points the interested reader to more detailed or focused treatments of the text. The author gives two important cues concerning how to read his work. First, he asks us to read it as an essay that offers both argumentation and exemplary evidence for the proposition that the religiously trained mind can gain the upper hand over all the contrary forces within us and outside us that drag us away from doing what we know to be best before God. Second, he invites us to join him in admiring the outstanding achievements of nine Jewish martyrs, whose courageous and praiseworthy example rivals that of the heroes of any other culture or tradition and can encourage us to hold fast to virtue in our lesser contests. I could multiply examples of how OTB strikes an excellent balance of brevity and substance. One could open the pages of OTB, having never heard of the Damascus Document–or any of more than 150 other texts–and walk away with a solid understanding of that writing’s legal and theological teachings. OTB has a nice focus not only on the extrabiblical texts as such; it also addresses their import for biblical interpretation. Further, the editors and contributors are careful to point out how these non-canonical texts function as windows into the culture and beliefs of Judaism in the Second Temple period. Philo’s writings had practically no influence on Judaism as it developed after the destruction of the Temple in 70 CE and the disastrous Jewish revolt in Egypt in 115–117 CE. … On the other hand his writings were warmly embraced by early Christian thinkers, who saw in him a kindred spirit. They were attracted to his use of the Greek Bible and the allegorical method, as well as to doctrines such as the transcendence of God, the creation of the cosmos, the Logos, and providence. 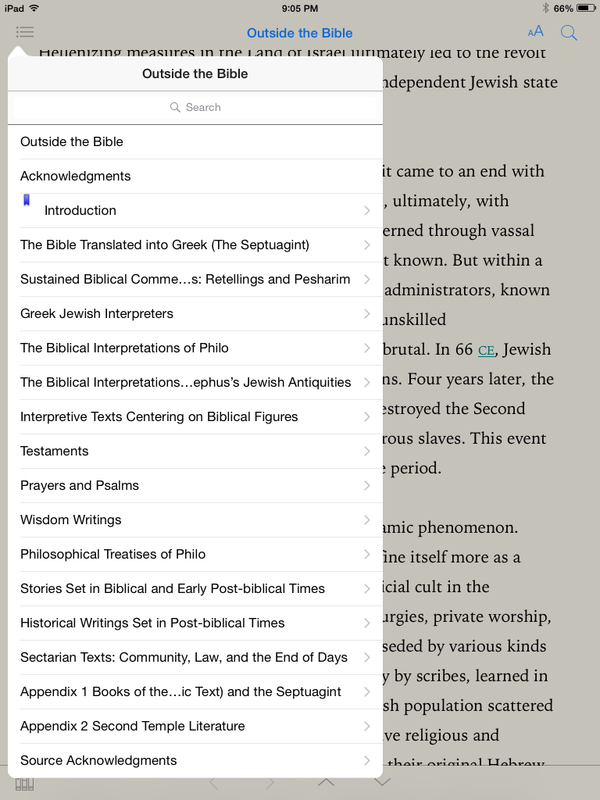 …which leads to why Outside the Bible is a resource especially suited for the Accordance format. One obvious reason a person would want to consider the Accordance module (and not just the print edition) is the portability factor. JPS books tend to be bound beautifully and constructed well, so there’s nothing to complain about in their aesthetics. But you can’t really take 3,300 pages of awesomeness to the library, coffee shop, or office with you, at least not easily. Keeping OTB on a laptop, iPad, and/or iPhone is appealing. Treat yourself to a perusal of the Table of Contents and some material on Jubilees (which interacts with Genesis) by following this link to a PDF excerpt. And, by all means, do go check out this majestic resource in Accordance here. Students, professors, and pastors… Jews, Christians, and agnostics–all who can access Outside the Bible are indebted to its editors and contributors for a thorough and engaging resource. 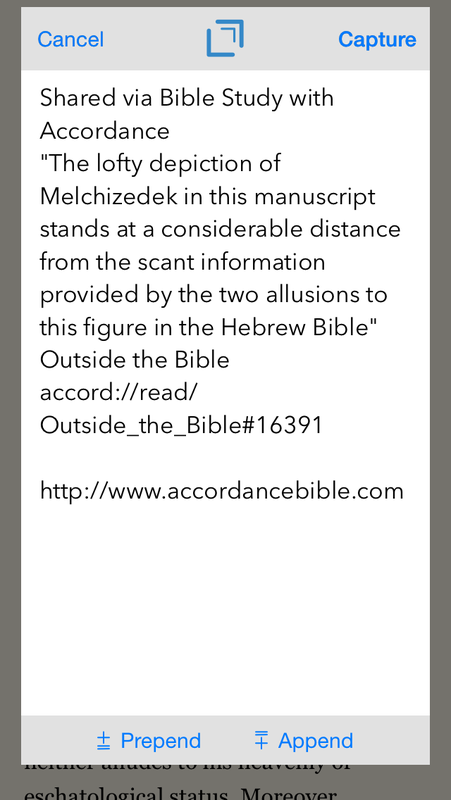 Thanks to Accordance for the review copy of Outside the Bible in Accordance 11. See my other Accordance posts (there are many) gathered here. Wow, this looks like a must for me. 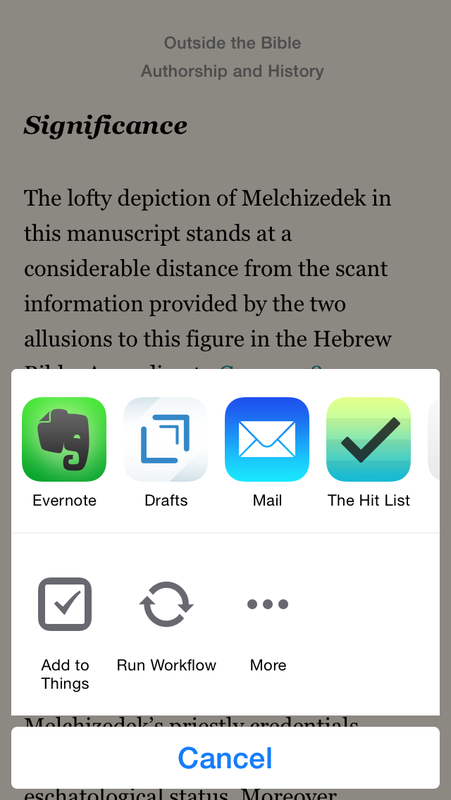 But in the search field, why isn’t Hebrew content listed? I had the same question–but the “Transliteration” field is how Accordance dealt with Hebrew content (since it’s transliterated Hebrew). 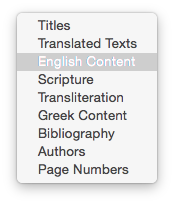 That search field does include Greek transliterations, too, but I don’t think that would really hinder any Hebrew searches.